Here is a time when it’s especially important to stay on your stand-up paddleboard. Two SUPers off Sunset Beach in Southern California recently encountered their extreme shark encounter on film. 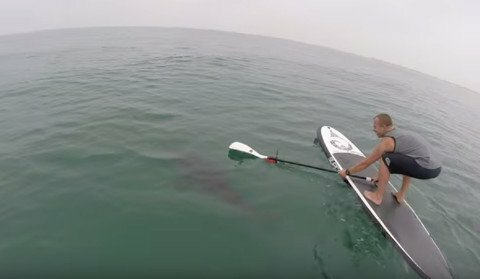 Courtney Hemerick and Joseph Truckles were paddling off the popular beach when they spotted five or six great white sharks in the water and started filming. At one point three sharks circled the paddleboarders as they dunked their GoPros in the water to get a look. At that moment was definitely not the time to slip off the board. One juvenile can be seen measuring roughly 7 feet long. They commonly congregate in protected bays, especially off the coast of California this year. Those bays often tend to be popular surfing spots. The juveniles are there to feed off sting rays, dead fish carcasses and other small fish, and are not normally a threat to humans. Adult great whites usually move on to other feeding grounds where they can reach up 20 feet long such as this shark in Mexico dubbed Deep Blue, which towers over a diver.